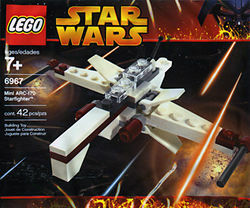 6967 Mini ARC-170 Starfighter was released in 2005 as part of the Star Wars Revenge of the Sith theme and is a mini-version of a Republic's ARC-170 Starfighter. This set was given free in a DURACELL battery pack and as a polybagged set. It was also inserted randomly into some Episode III Collectors' Sets. The set is made up of mainly white and dark red pieces. The front of the ship is a white slope going up into a dark red flat brick, with a white tile brick on top leading to a black brick, representing the cockpit. A transparent flat brick is on top of half of the cockpit and another transparent piece is behind, representing the gunner and passenger's seats. The light stone grey lever piece behind the transparent pieces is a gun. To the left and right of the ship are white fin pieces, which can be moved up and down, both under and above the main wings. At the end of the main wings on both sides is a black stick, representing the outer and main guns. Underneath the cockpit on each side are two 1x1 cone pieces, which are the main engines. The ARC-170 Starfighter, or Aggressive ReConnaissance-170 Starfighter, is a heavy bomber and fighter that was used in the Clone Wars and the Rise of the Empire era. They posses six Proton Torpedos and heavy guns, and specialized in Strike Forces, often escorted by other ships. The set involved in a DURACELL promotion. Facts about "6967 Mini ARC-170 Starfighter"
This page was last edited on 15 March 2016, at 06:02.